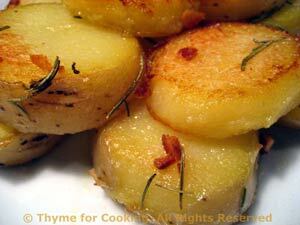 Potatoes, boiled than crispy-fried, an easy side dish. Put into a sauce pan, cover with water (add a pinch of salt) and bring to a boil over medium-high heat. Drain, cover with cold water and drain again. Let rest for 5 minutes, (or longer) then cut into slices 1/2" (1.25cm) thick - about 3 slices per half.